• Trophy icon (A) takes you to the Trophy Room. You can access it after earning your first trophy. 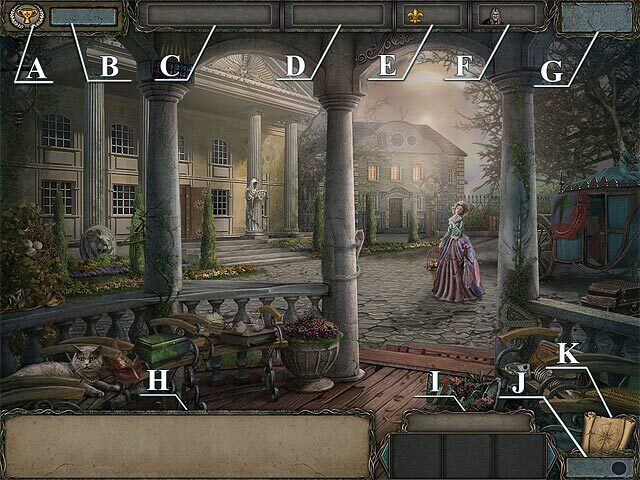 • Strategy Guide (B) opens this guide for the walkthrough and hints. • Current location (C) shows the name of your current location. • Score (D) shows your progress. You get points by finding items, earning trophies, and completing mini-games at the end of an episode. • Move your cursor over the Fleurs-de-lis icon (E) to see how many are in the current location. Every location – beginning with the Front Door by the Mansion – has two to four fleurs-de-lis. • Bandits (F) tracks how many bandits you’ve shot. • Main Manu (G) takes you to the main menu. • Items to find (H) tells you how many items are hidden in your current location. Some items hide inside or behind other items. • Inventory Tools (I) are inventory items that interact with other items. • Hints (J) shows the number of hints you have available. • Map (K) opens the map so you can visit other locations.